Weekend sewing - in pictures. I love fabric. Bet you knew that already! I have been collecting Liberty Tana Lawn slowly and steadily for a number of years. When I spotted the release of Alexia's book featuring Liberty fabrics I knew I had to get my hands on a copy. Bursting at the seams with 25 different projects this little pincushion project called my name. Pronto ~ get out the rotary cutter and the Tana Lawn stash! These fabrics are so delightful to work with. And I couldn't just make one! I don't think you can ever have too many pincushions. Right? 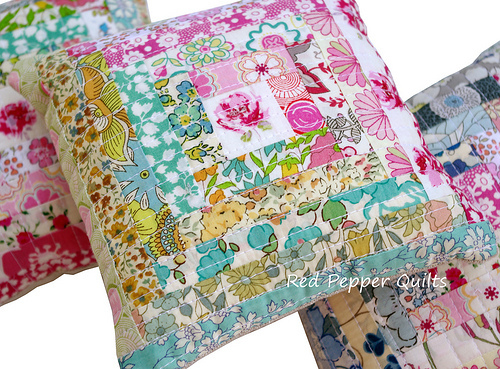 These will also make great gifts for quilting and sewing buddies. (I have used Robert Kaufman EssexYarn Dyed in Flax for the back). As soon as I saw these pop up on flickr, I RAN over here. I was hoping you were listing these in your shop :) They are beautiful! These are beautiful! You are right, you can't have too many pin cushions. 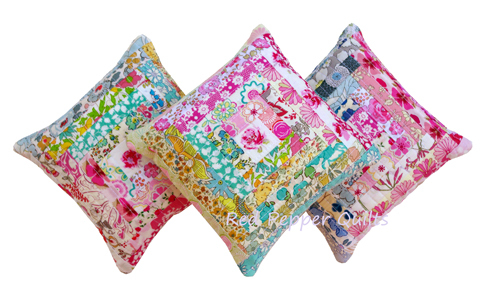 Gorgeous pincushions--way to pretty too stick with a pin! I agree with Donna. I love Liberty and today started a quilt for my bed using 4" squares I have been collecting for a while. I have been counting and sorting and pairing up all day. They are ready to go! I replied to this yesterday but it seems to have disappeared. I have bought from Veryberryfabrics who sell on Folksy. Ali has packs of squares, both 4 and 5 inch and she sells single pieces. I have collected a huge variety this way with no more than 4 or 5 the same. I have also bought on eBay although you have to be a bit of a mathematician to make sure you are not being ripped off. Have just done the first row on a quilt and the fabric is delightful to sew with, not too delicate at all. Those are so adorable. The fabric was a perfect fit for the project. These are beautiful, and I've been tempted by the soft sound of lawn fabrics.......Do you have to do something to the lawn fabric to stabilize it........such as spraying it with starch or something? These are absolutely precious! 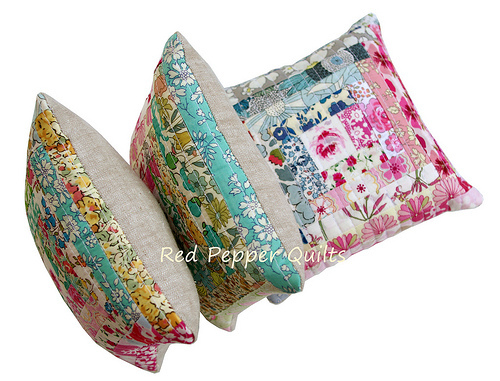 I love the liberty fabrics they always make such beautiful projects. Oh they are beautiful Rita! I would also be interested in how to use these lovely fabrics in quilt projects. Is it possible to collect charm packs or something like that as a yard at a time is very expensive. The pincushions are beautiful! I lust after Liberty! I love these and I'm not really a liberty fan, I love the colour combo, the pink on one side versus the blues on the other so pretty :)I've pinned them already! They look so cute! Lovely fabrics,I want them in my stash. 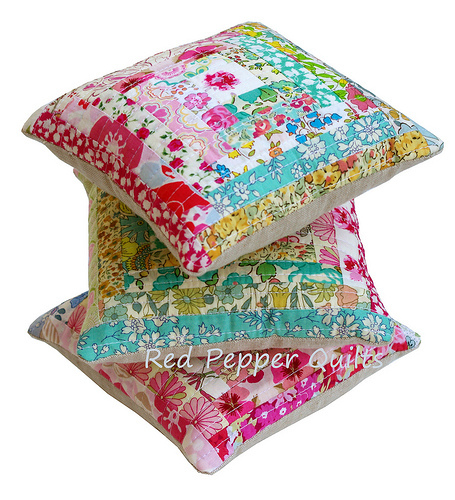 beautiful cushions...I love log cabins quilts and I love Liberty. I've been collected a wonderful stash of Liberty prints over the years to make myself a quilt at some point. it's a great book, isn't it?!? i love liberty! I got it too! 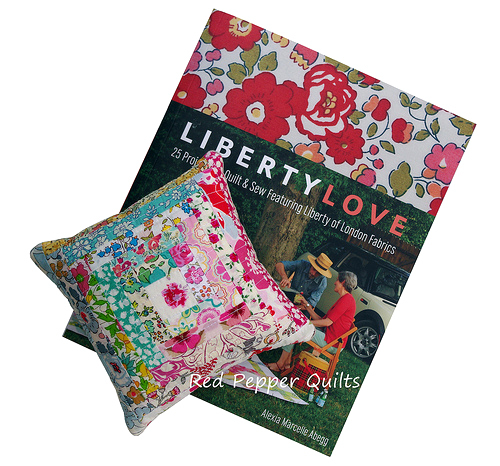 I've got a little stash of Liberty lawn and the new quilting line too. Still haven't done anything with it as yet ~ but the book sure is inspiring! Thanks for the little push. How could one not be happy looking at a pillow like that! Love it! very precious! what wonderful gifts these would be! This looks like a ton of fun. What a great way to use up some stashed fabric.